Filed under lego on December 09, 2012. 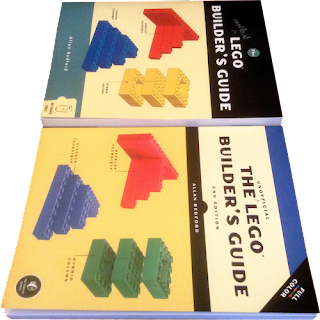 As most folks know, I am a huge fan of the first edition of Allan Bedford’s wonderful The Unofficial LEGO Builder’s Guide. Back when Nikki and I were still hosting the BimPCast, we had Allan join us to discuss his new book in BimPCast 24. Wanna listen to our discussion? Click here. Imagine my thrill when I learned Allan was in the process of updating the book to a second edition. Further imagine my thrill when No Starch press contacted me and asked if I would be interested in a review copy. “Of course!” I replied. But what changes did Allan need to make to the first edition? 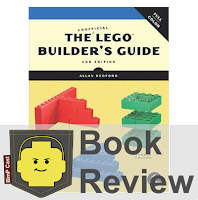 The book was already a treasure trove of LEGO building goodness and although it was six years old, it was not a book I consider “out of date.” Turns out that there was room to make this book even better. So after the click below, let’s take a look at the new edition, discuss whether first edition owners should upgrade and if the book remains the de facto standard for any self respecting AFOL’s bookshelf. Editorial Note: My review will focus on the changes from the first to the second edition. There are many other reviews online that review the text as if it is a first edition. I believe most of our readers will want to know whether they should upgrade to this new edition. 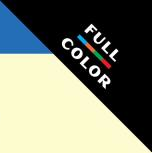 Let’s begin our review with the major change that is immediately apparent when comparing to the first edition – the use of full color. There is even a banner in the upper right-hand of the title page to highlight this new change. One of the only suggestions I had for the first edition was to include color to make it easier to understand the models and techniques. I was very happy to see this occur in this new edition. The images aren’t simply a reprint from the first edition, they are newly rendered images courtesy of Eric “Blakbird” Albrecht. The image updates are bright and colorful. The paper stock used is slick to ensure the images are crisp and clear. The image below provides a quick sample of a before and after page, or close approximation since the pagination is different for this new version. You will immediately notice how much easier the tube, in figure 3.5, is to visualize with color and the enhanced photo realistic rendering. Click for larger view What makes these images even more amazing is that Eric created and rendered these images using mostly free software. I won’t give away his secrets, since they are listed in the back of the book, but suffice it to say that these tools provide some amazing results that can be duplicated by AFOLs everywhere. Another noticeable difference between the two versions is the thickness of the book and the number of pages. Both of which you would expect to be greater in a second edition; however, that is the complete opposite for this text. The second edition is thinner, lighter and has fewer pages. The first edition contains 319 pages and the second 221 pages. While the reader might immediately assume that 100 pages of content were removed (we will look at this in the next section below), the change in page count is also attributed to a more efficient layout, a change in paper stock thickness and the removal of excess words to make sentences more concise. Overall the book is easier to read and much more attractive. Let’s look a bit more at the content. Allan reduced the book from 13 chapters to 10 chapters. 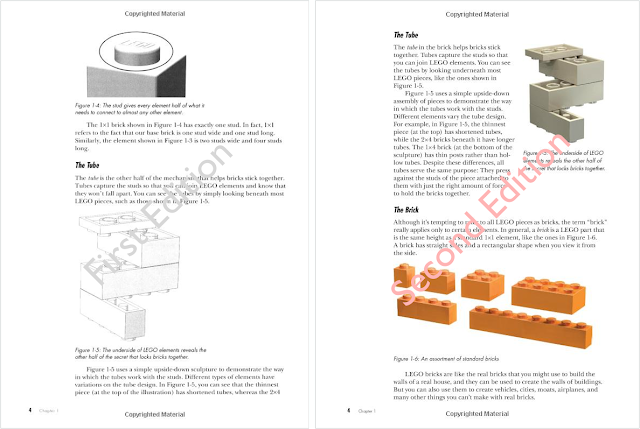 The chapters removed include: Technic, sorting and storage, and making and using LEGO tools. I completely understand the decision to remove the Technic line since those elements are really for a differing hobbyist and No Starch has The Unofficial LEGO TECHNIC Builder’s Guide available (review coming soon). I can even live with the exclusion of the LEGO tools chapter; however, I thought sorting and storage to be one of the best chapters in the first edition. Sorting and storage is an oft discussed topic in the AFOL community and while there is no one answer for every hobbyist, the inclusion of Allan’s thoughts in the first edition at least gave someone new to the hobby options to consider. I will miss this chapter and will retain my first edition specifically for this information. This new, more readable, sentence comes in at 21 words and 114 characters. As you can see, with rewrites such as these, the page count was bound to be less and the content easier to read. I applaud Allan and his editorial team for thoroughly scrubbing the text and making it more efficient. If you are an AFOL or a BimP reader, you probably already own the first edition and are asking yourself whether you need to upgrade to the second edition. Normally, I would dissuade you from a second edition for a book such as this; however, in this case I’m making an exception. I highly encourage you to purchase this new edition. You will find it easier to read and more attractive. The color will also make it a great conversation piece for your coffee table. If you want to share your old book or simply don’t want multiple copies of the majority of the information, hand the first edition down to a younger family member or someone new to the hobby. Before you do though, I recommend you make a copy of the sorting and storage information from chapter 12. If you don’t own this book, a purchase is a “no-brainer.” This book is perfect for the old and new builder alike. It teaches the basics of building (structure, scale, planning, and technique) that every hobbyist will find of value when finalizing their own “my own creation” (MOC). It also serves as a wonderful reference when you find yourself looking for inspiration. You’ve done it again Allan. You’ve created the definitive book on the basics of LEGO building. How are you gonna top this one? Gotta go. I have a tub of bricks and elements calling my name.